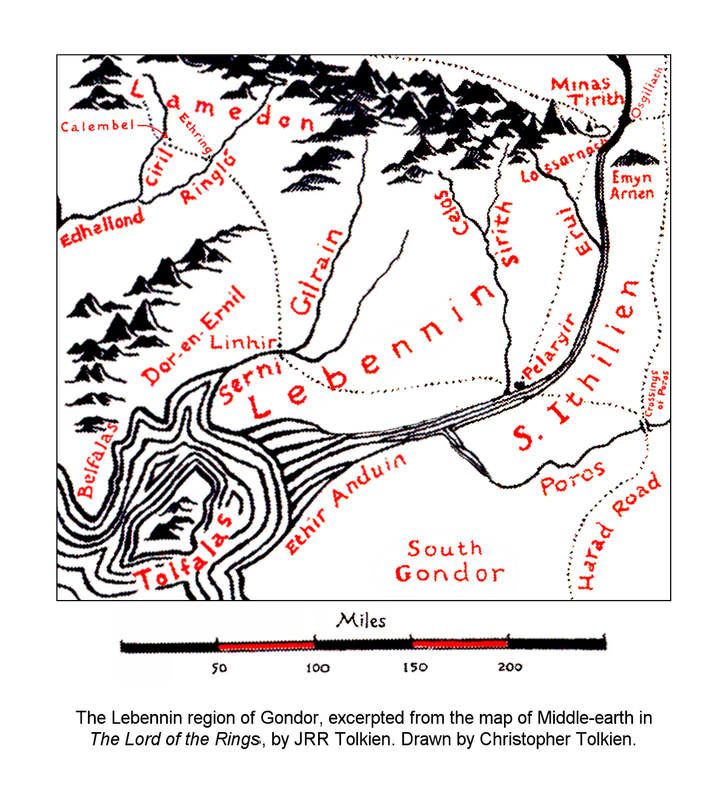 Location: A river of Lebennin in Gondor, originating in the southern White Mountains; joined by the river Serni at Linhir, before flowing into the Bay of Belfalas west of Ethir Anduin. Lebennin and its environs, showing the River Gilrain. 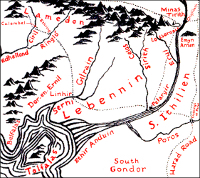 The... narrative was actually composed as an offshoot from an etymological discussion of the names of certain rivers in Middle-earth, in this case the Gilrain, a river of Lebennin in Gondor that flowed into the Bay of Belfalas west of Ethir Anduin, and another facet of the legend of Nimrodel emerges from the discussion of the element rain. This was probably derived from the stem ran- 'wander, stray, go on uncertain course'.... This would not seem suitable to any of the rivers of Gondor; but the names of rivers may often apply only to part of their course, to their source, or to their lower reaches, or to other features that struck explorers who named them. In this case, however, the fragments of the legend of Amroth and Nimrodel offer an explanation. The Gilrain came swiftly down from the mountains as did the other rivers of that region; but as it reached the end of the outlier of Ered Nimrais that separated it from the Celos... it ran into a wide shallow depression. In this it wandered for a while, and formed a small mere at the southern end before it cut through a ridge and went on swiftly again to join the Serni. When Nimrodel fled from Lórien it is said that seeking for the sea she became lost in the White Mountains, until at last (by what road or pass is not told) she came to a river that reminded her of her own stream in Lórien. Her heart was lightened, and she sat by a mere, seeing the stars reflected in its dim waters, and listening to the waterfalls by which the river went again on its journey down to the sea. There she fell into a deep sleep of weariness and so long she slept that she did not come down into Belfalas until Amroth's ship had been blown out to sea, and he was lost trying to swim back to Belfalas. This legend was well known in the Dor-en-Ernil (the Land of the Prince 1), and no doubt the name was given in memory of it. ran- 'wander, stray' in Rána, the Moon, and in Mithrandir, Aerandir; also in the river [Gilrain 2] in Gondor. 2 This text, the only mention of the river Gilrain of Gondor that appears in The Silmarillion, spells it as 'Gilraen', which appears to be an error.